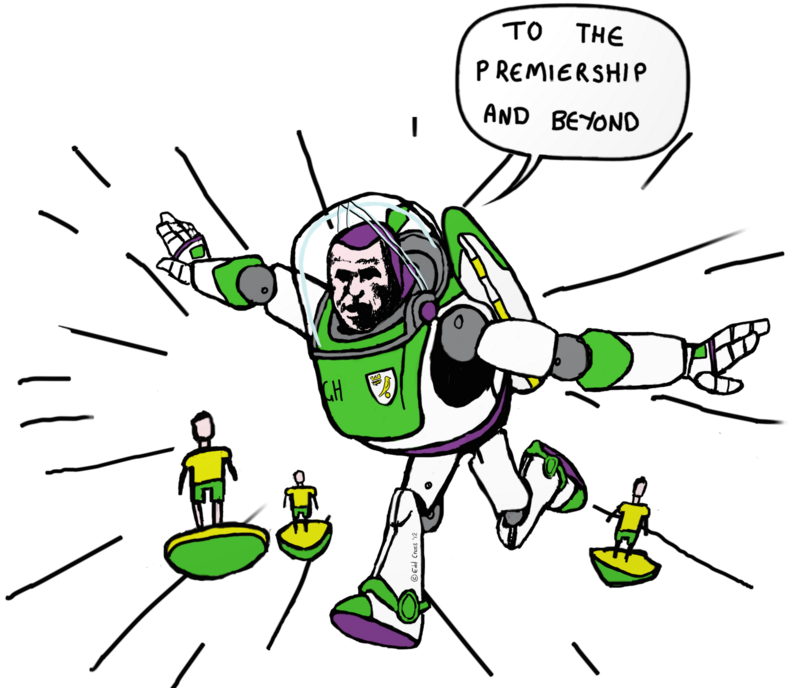 Holt Lightyear – To The Premiership & Beyond!! Edd May 4, 2012 No Comments on Holt Lightyear – To The Premiership & Beyond!! Grant Holt + Buzz Lightyear = Holt Lightyear!! And so here is my second image for Holtamania.com, which went up live last week. The last few times Holt has scored he has been celebrating with his arms out like wings. And I just kept thinking about Buzz Lightyear from Disney’s Toy Story with his wings thinking he could fly. Next came, Buzz’s saying ‘To Infinity & Beyond’, so I altered that to represent fan’s recent hopes that he may be called up to play for England, but it also shows just how well the team have done to get back into the Premiership and surviving well! As he is a toy, I could not help but put in some NCFC subbuteo players in the background! Now, every time I see Buzz’s face, I keep seeing a likeness to Holt and makes me chuckle! I’ll never be able to watch Toy Story in the same way ever again!